Do you ever get stumped? 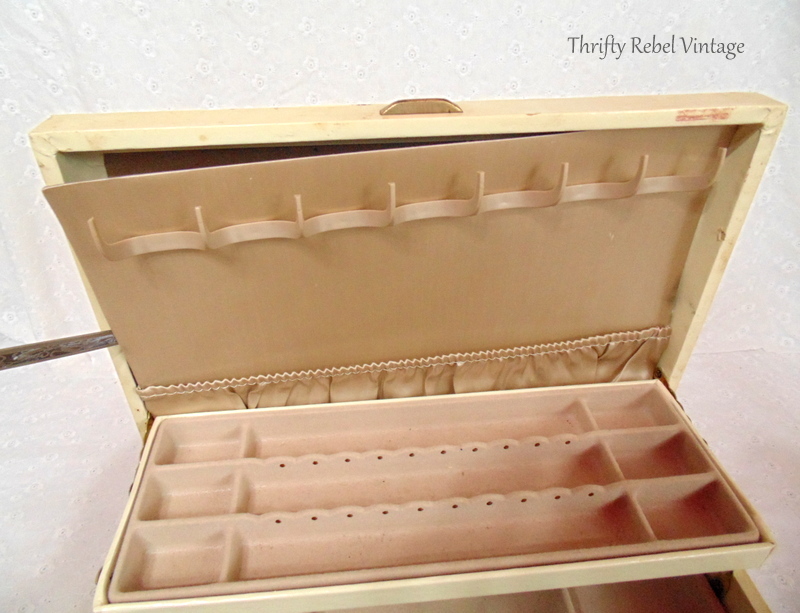 That happened to me with my vintage jewelry box makeover. It happens to all of us… right? My ideas for this jewelry box makeover were all over the place, and for whatever reason I couldn’t commit to any of them. 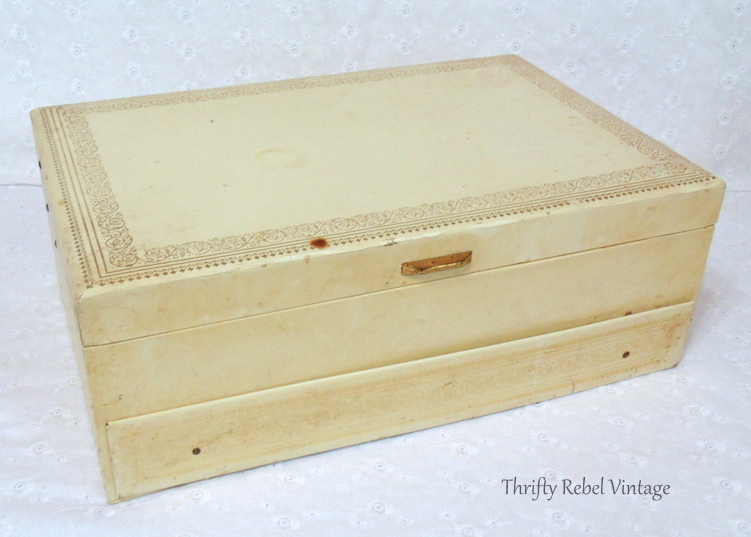 Here’s the jewelry box that I shared a while back in this Finds post. After a few weeks of looking at it I was still not able to decide what to do with it, so I put it away to avoid being confronted with the indecision every time I went into my craft studio. That was the best thing I could have done because then one day it happened… the idea happened… just like that… out of the blue. I heard someone use the expression…. ‘that’s music to my ears’… and that was all I needed. 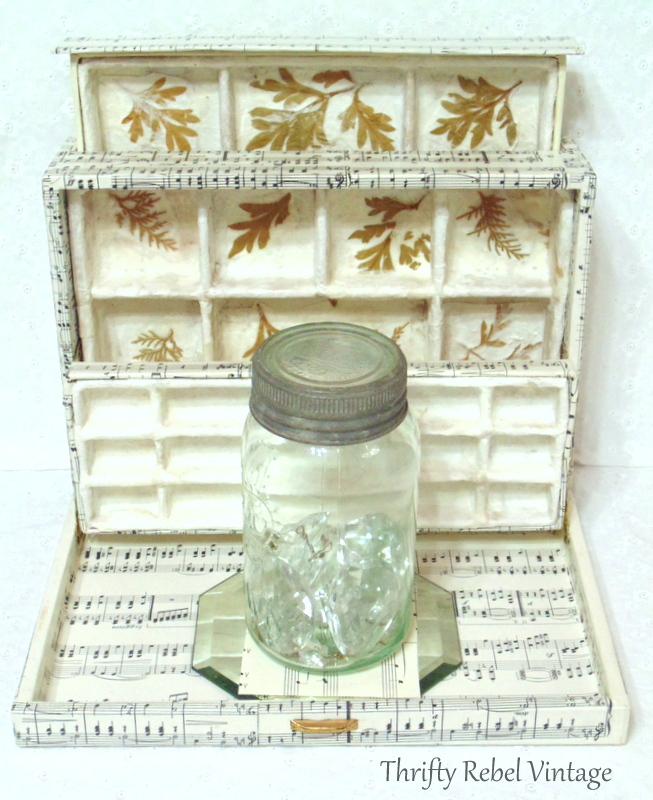 I love to store my jewelry that I wear on a regular basis where I can see it, like this vintage cooking grill jewelry storage and this candle holder turned jewelry holder, but it’s nice to put away pieces that I don’t wear often or that are going to be sold in my etsy shop eventually. 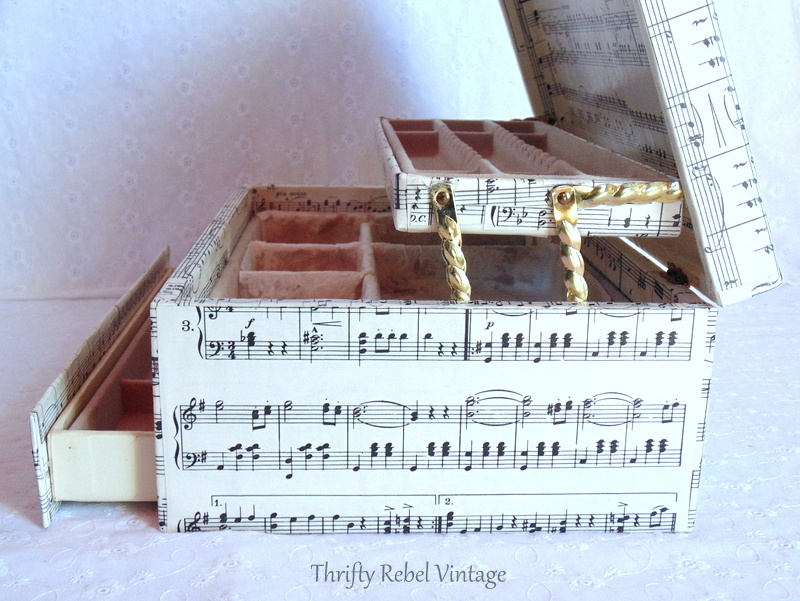 For this jewelry box makeover all you need is some Mod Podge, vintage sheet music, some handmade paper, scissors, and a small paint brush. The first thing I did was remove the back area on the inside. I didn’t like it and I wouldn’t use it anyway. It was glued in a couple of spots, but it popped out quite easily. 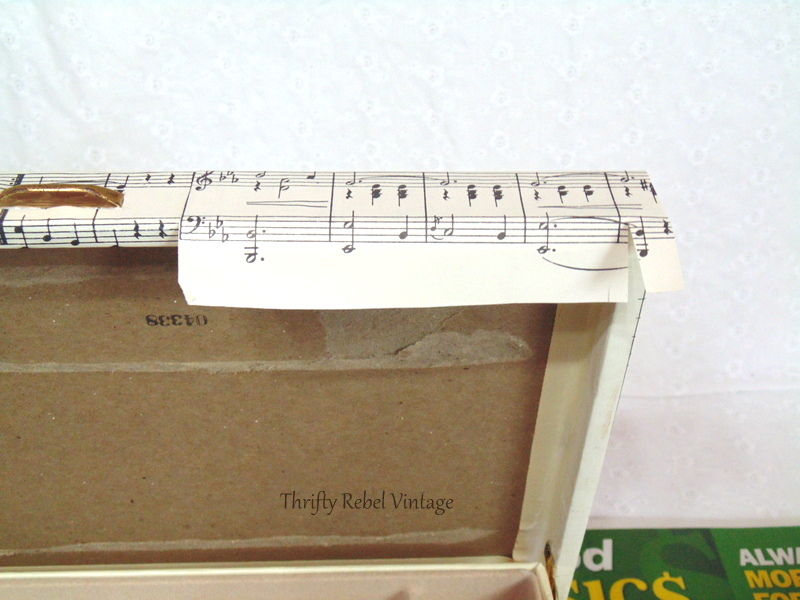 Then I just cut sheet music to fit in various areas of the jewelry box as I went around. The above is the front of the lid. Here I’m fitting a piece to slide down around those metal hinge pieces. 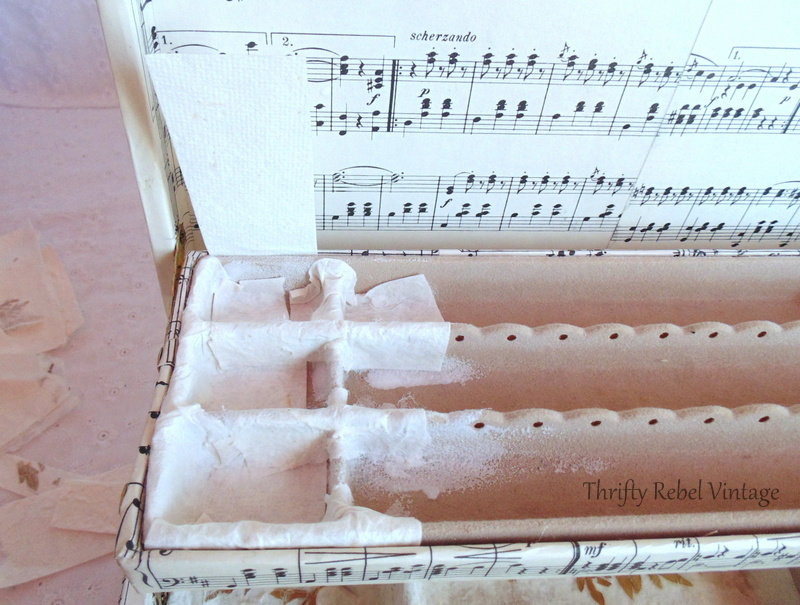 After applying some mod podge onto the surface of the jewelry box, and on the cut piece of sheet music, I put it in place. You can see this on the left side of the picture below. 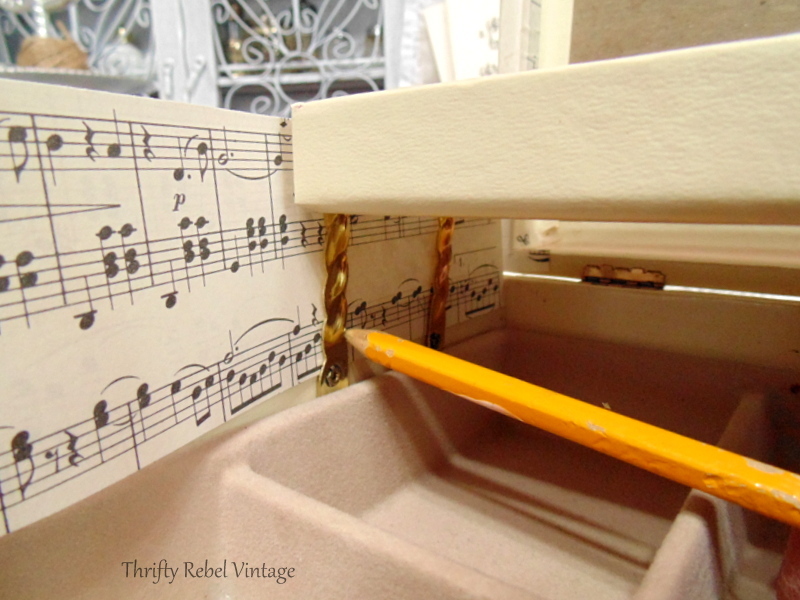 I worked my way around, tucking the sheet music in between the interior dividers and the sides of the box. 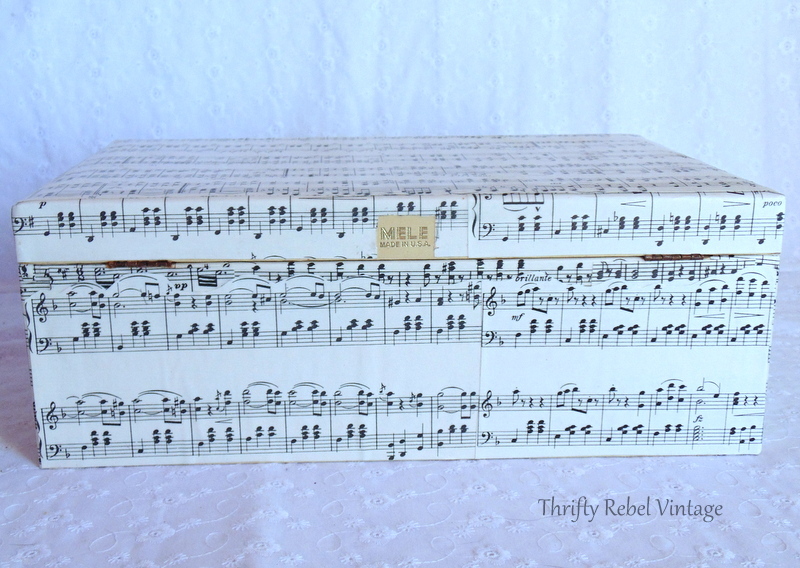 Then I framed each side in sheet music. 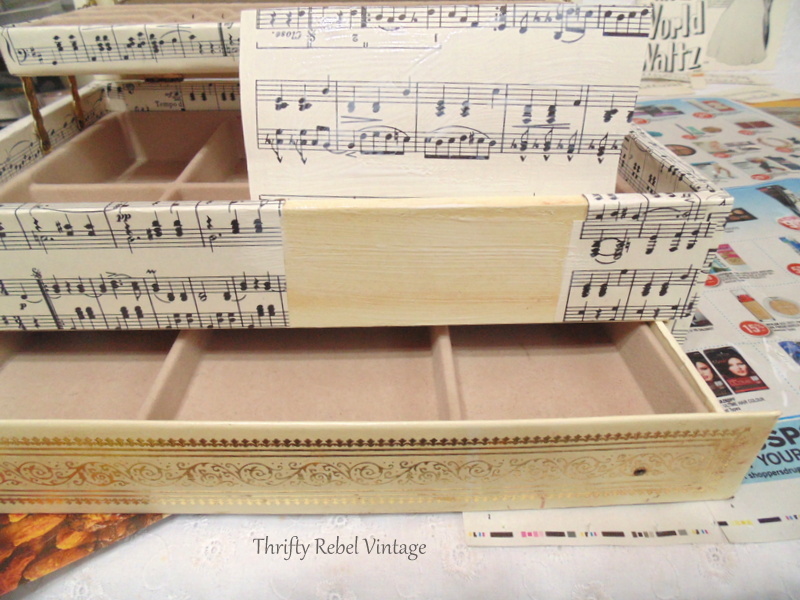 … and the top, always applying Mod Podge to both the sheet music and the jewelry box. For the sake of history I left the jewelry box maker’s mark on the back uncovered. After finishing the outside it was time to do the inside. I really didn’t like its coloring at all, but I liked the design and the way it was laid out. This is where the handmade paper came in. The great thing about this paper is that with a little moisture applied to it, like mod podge, it can be manipulated and shaped. I’ll be covering up all those holes because I never wear stud earrings. The original plastic interior liners had some kind of felt-like texture on them. 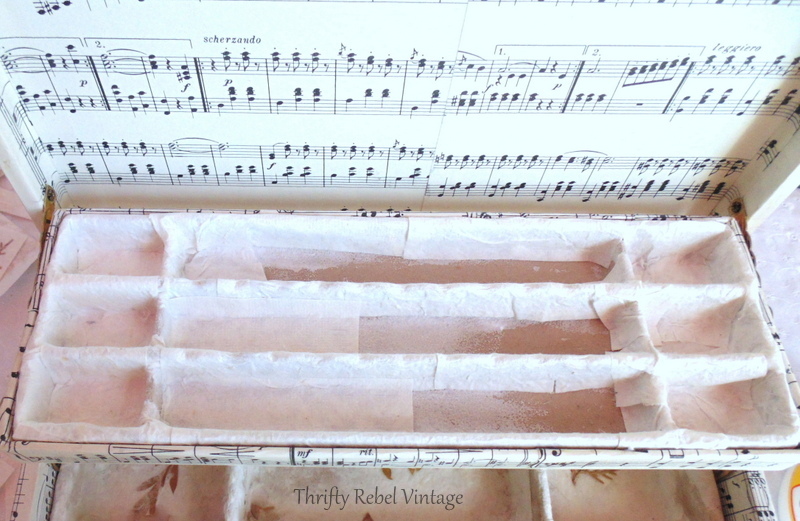 I applied mod podge onto both the liners and the paper and filled them in bit by bit. After doing a base layer all the way across I let it dry and then applied a second. I did the same thing with the other interior levels of the box. This process kind of reminded me of papier mache, but it wasn’t quite as messy. I had to keep washing my sticky fingers so they wouldn’t pull off the paper while I was working with it. I really wanted a mirror on the inside of the box so I added this thrifted one with E6000 glue. 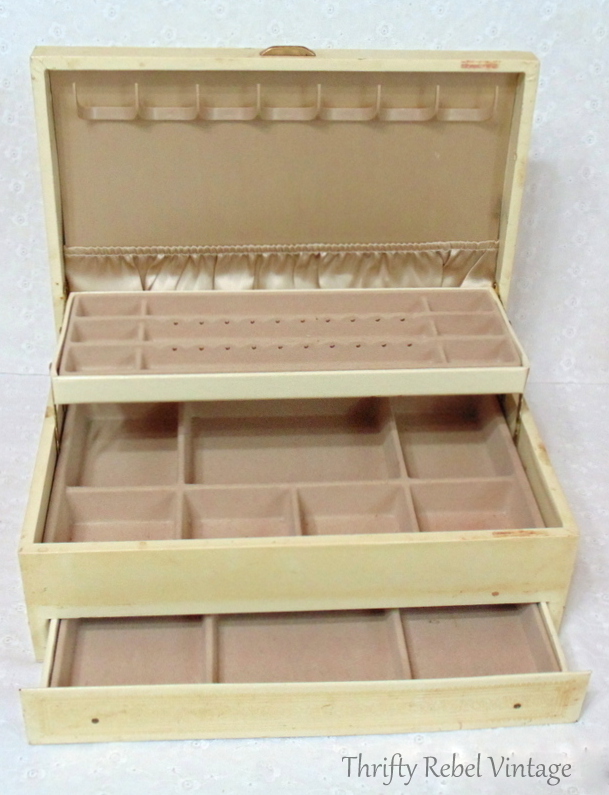 So here’s the very dated and tired looking jewelry box before. I found a bunch of this handmade paper at a thrift store years ago for $1. Those are real dried leaves in the paper. Even though I won’t see the leaves when the box is filled with jewelry I love them, and I’ll know they’re there. It’s kinda fun to hide design elements like that. This $2 thrifted jewelry box had seen better days. 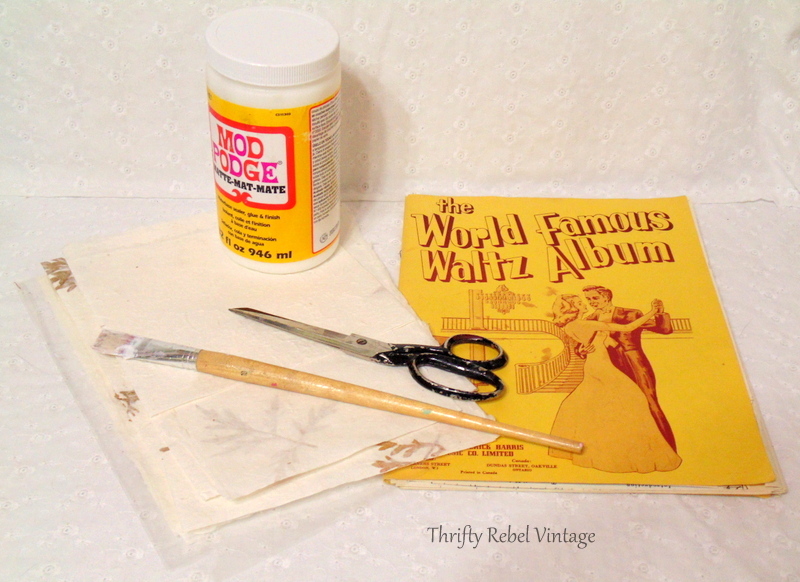 Now it’s waltzing into the future with a fun vintage look. This black and white version of the cover was inside the book. 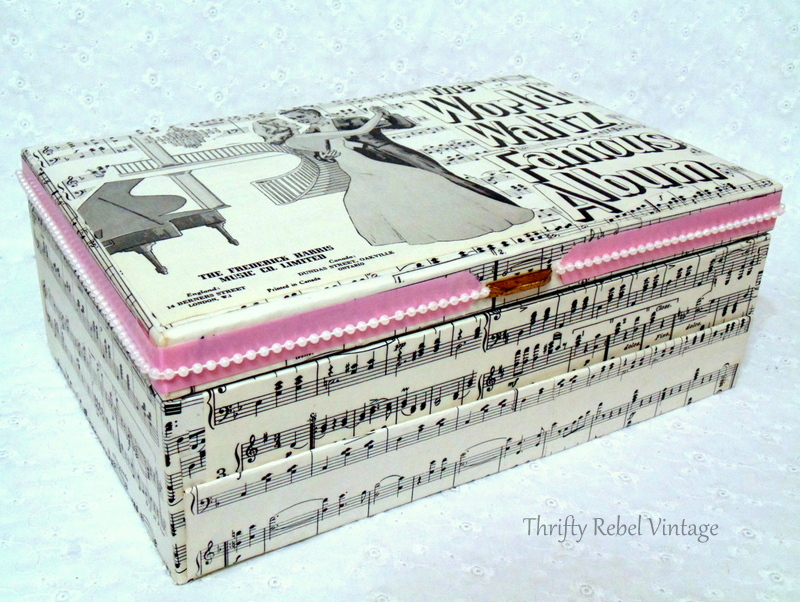 I loved it so much that I cut it into pieces so it would fit and I decoupaged them on the top. Then I gave the whole exterior three coats of mod podge. To girlify it a bit I added some pink ribbon and some small faux pearl beading using my glue gun. That’s really all it needs I think. What? Did I really say that? lol. I’m so happy that after a few months of struggling with this project it’s finally done, and I really love the way it turned out. So if you’re ever stumped by what to do with something, maybe try putting it away for a while. Once you stop thinking about it an idea might just come to you. It’s sort of like finding something you lost as soon as you stop looking for it. lol. 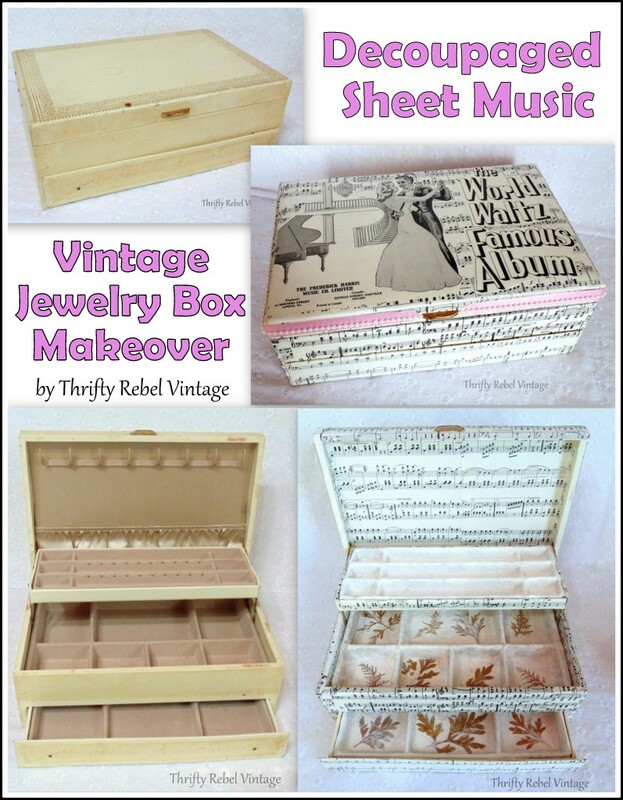 If you enjoyed this jewelry box makeover please share it with your friends, and if you’re not already a subscriber you can easily sign up using the form at the top of my sidebar. 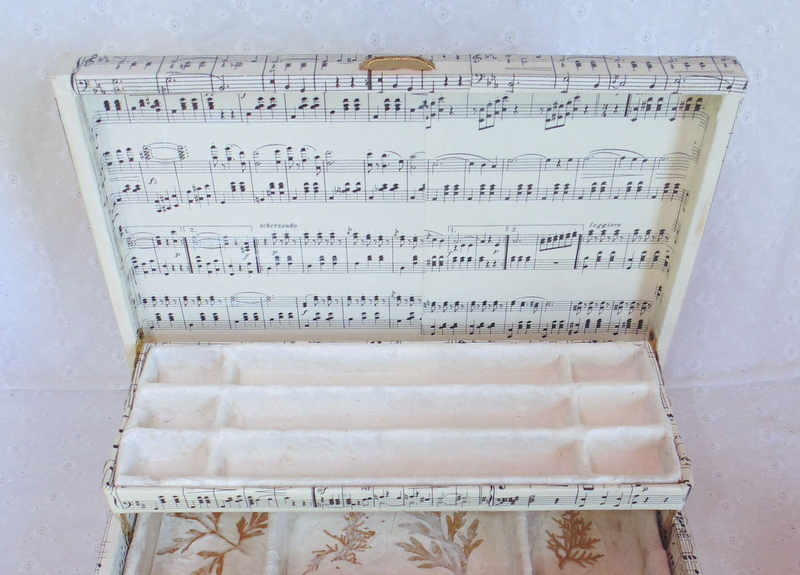 UPDATE: The words on the top of the jewelry box should read The World Famous Waltz Album. You can read about how that happened at How to Succeed at Messing Up a Project Without Really Trying. Thanks so much Dona! I’ve never made paper, but I’ve seen it done. Looks like a lot of fun! I’ve been waiting to see what you did with this b/c I have a large one….same way…dated, but the paper lining was coming off the outside. I tried fixing it with decoupage & bits of paper, but haven’t liked it at all. Tried getting more of the outer coating off, but not having much luck with it. Did you try to get the outer coating off or did you leave it on? Thought about painting over everything, but really wasn’t liking that idea either. So I like this idea & how you have updated it! Mine is one of those large ones with side pieces that fold out. I’m really afraid I’m going to get in over my head with it. I am so impressed that you got all those lines straight and matched up! Thanks Dianne! The sheet music really does most of the work for you. It was quite easy, just time consuming because of all the pieces. Absolutely Fabulous! I can’t wait to find and make my own beautiful creation!!! My goodness that was a lot of work . . . and patience fitting all of that paper around the drawers and hinges but it all paid off. I have to say I LOVE that blue and white flower pin — those vintage pins are my favorites! Thanks Lauren! That’s a favourite pin of mine too. I used to have an enamel flower pin collection but sold most of them some time ago. This one made the keep pile. P.S. I like your new header too! You are so creative. 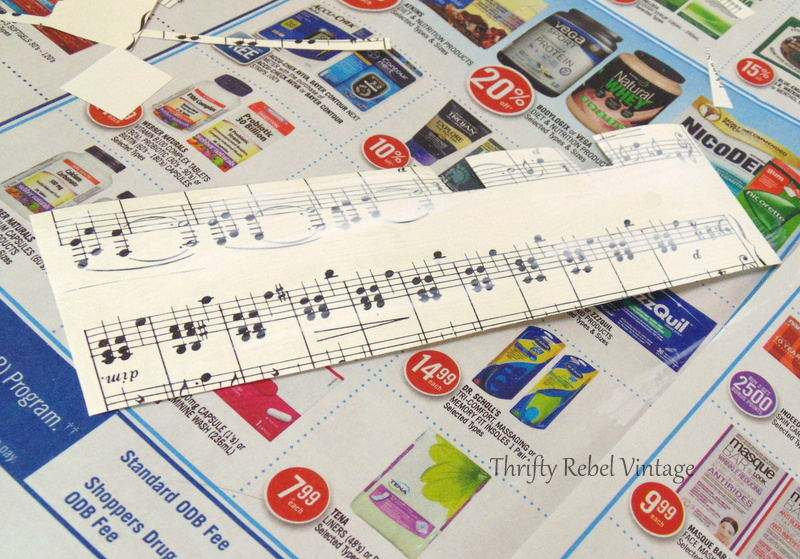 I love your use of sheet music. Great makeover! Wishing you a blessed Easter. What a great idea. It turned out very nice. I didn’t notice a handle-type pull on the bottom drawer, before or after. Wondering if some type of stud earring could somehow be used for that function, to add character. 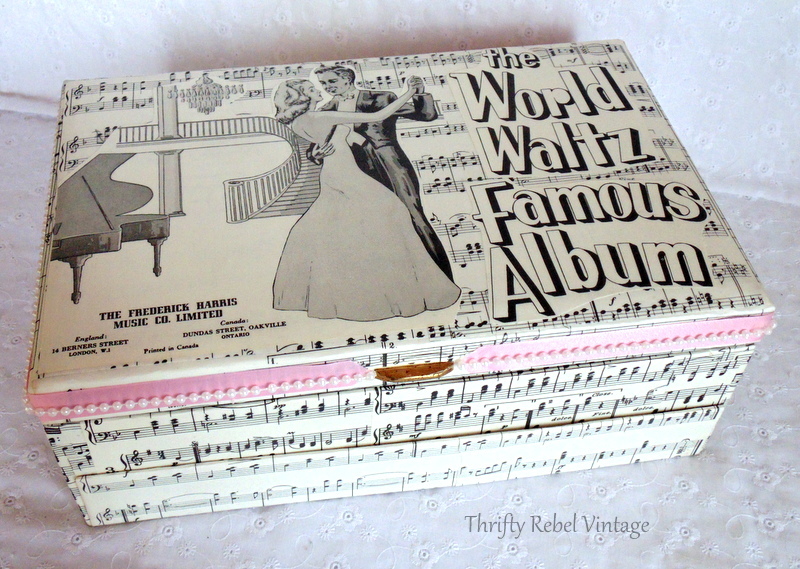 Not a fan of the pink ribbon trim, I’d prefer just the sheet music…..overall, a very classy & unique make-over. You never know…your idea make set a new trend. Look fwd. to your next project/makeover. Thanks Linda! The bottom drawer doesn’t need a pull because it pops out automatically when the lid is opened. It’s a pretty cool feature. The pink ribbon could certainly be left off if it’s not your thing. 🙂 I tend to like a littke extra girlification. I should have known about the drawer opening at the same time as the lid…I’m of that era. You are absolutely right about the extra girlification (I like that word)…may have to borrow it, with your permission, of course. You always come up with the most clever ideas! This is adorable! 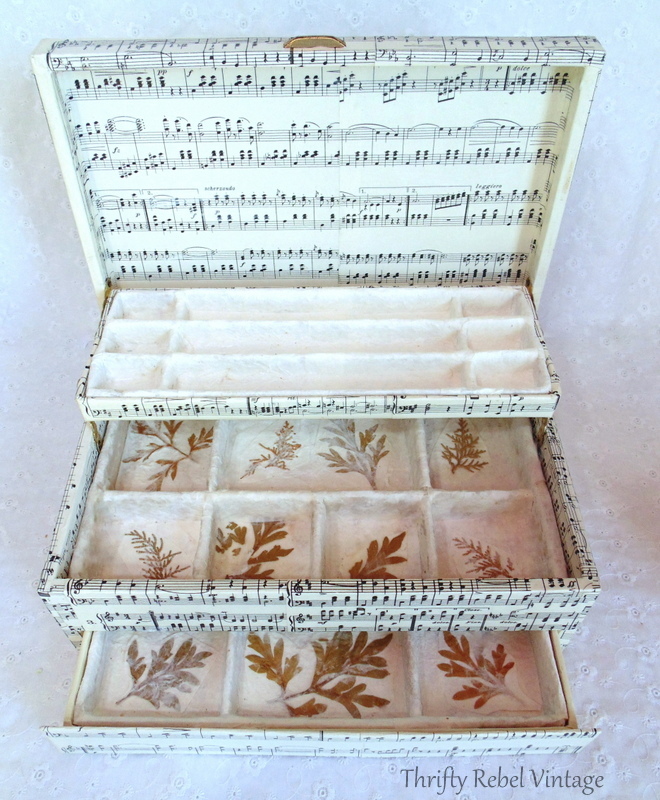 I have about 10 of these jewelry boxes in different sizes and condition. I use them to store all my vintage costume jewelry. I like to repurpose old and broken jewelry into new and fun baubles. 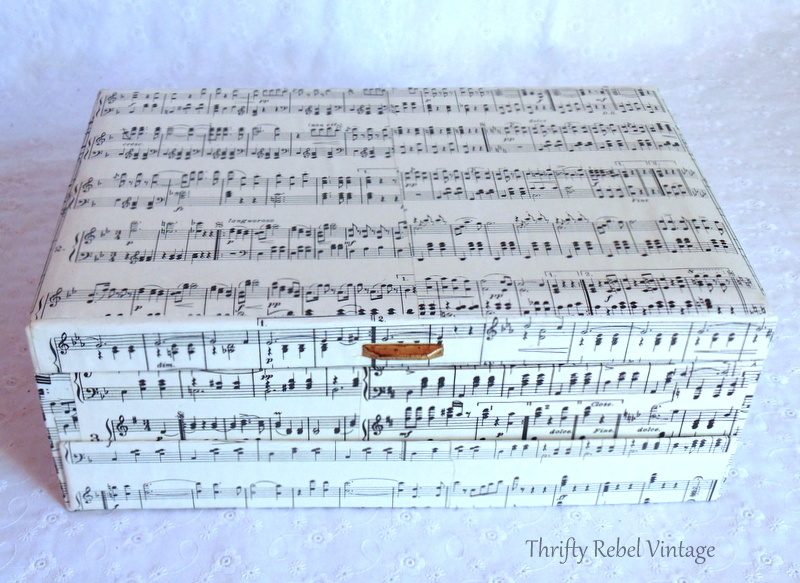 I’ve thought of doing something to the outside of some of the ones that are in sad shape and I love what you did so I just might have to try this with old sheet music. I just happen to have a small collection of that as well. Oh, my! Very cute repurpose! Thanks very much Judy! I love costume jewelry especially. Sounds like you have a lot of it. It’s so fun to repurpose in so many ways. I just added an update to this post. You can read about how I messed up the words in my post today. Thanks, I read it and left a comment but I’m not sure it posted. I got a message stating I had to update my subscription before it could post. There seemed to be a problem though. I’m going to check it out. I loved the update though. 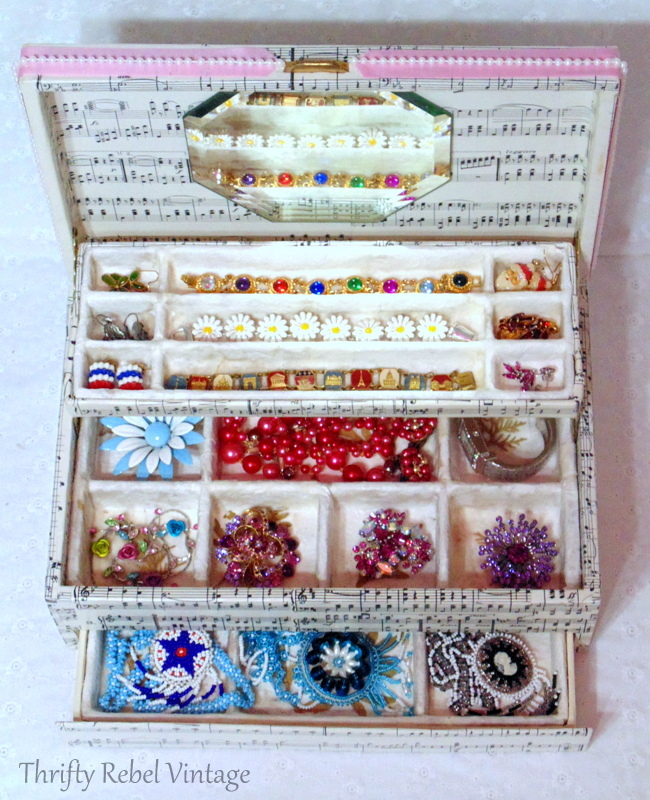 The jewerly box looks fabulous. I never would have thought to decoupage it to bring it back. I have my childhood jewerly box to it isn’t in good shape. Thanks Debra! 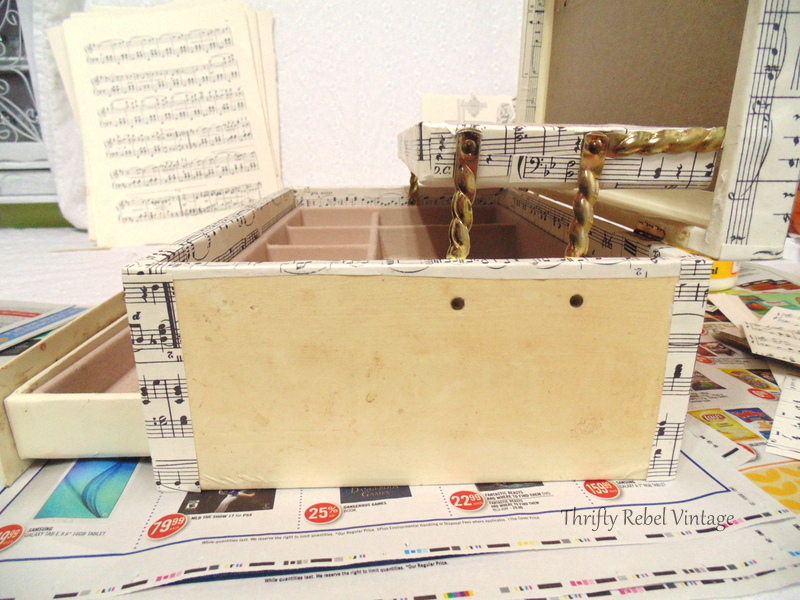 Decoupage is the only thing that made any sense to me, and it’s one of my favourite things to do.